Summertime for me is spending time by the water. Whether at the cabin by the lake, visiting the coast or even just having time to walk by the river here in the city. As a bird lover I'm immediately drawn to my feathered friends. Sketching birds in plein air is challenging, they are always on the move. So it helps to be armed with a fast camera and lots of patience. Don't rely entirely on photographs though, make little gesture sketches that record common poses. You can then refer back to those sketches and add birds into your larger compositions. This painting is a good journal project…. and this seagull is a painted paper collage. Both projects use a blurry line technique. In the past I used gel pens but their quality has gone up in recent years and it's getting harder to find ones that will bleed when hit with a water wash. There are other options. My favourite is the Stabilo pencil. It's easy to draw with and works on paper, glass, plastic and metal. I have to buy mine at a fine art supply store and they are about $2.00 a piece. You can also use a watercolour pencil. You get a similar blurry effect. They are not as soft as a stabilo so I find them a little harder to sketch with. A charcoal pencil will give you a bit of blurriness, you can smudge them with your finger before adding the water wash to enhance this a bit. Watercolour markers will also give you a blurry effect. I use them often at school as they are on every student supply list. My only complaints are they can blur too much and you may lose definition in your sketch. The colour also changes and your black fades into blues and purples. 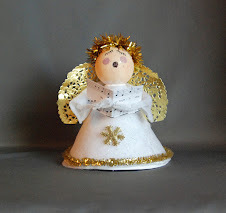 - paper, you can use an art journal or a nice quality drawing paper. At school I use this paper a lot. Although it is called white construction paper it's not a construction paper. It paints up nice. You don't get WC paper effects but it is a good alternative and it's cheap. It's an amazing drawing paper (better than the so-called drawing paper most suppliers carry) and has enough tooth (rough surface) to take pastels (both oil and chalk) beautifully. Let's start with the journal page. Now I made a journal page but you can easily make this into a single page project. Select a shorebird you would like to draw. Here I sketched a spotted sandpiper. I used some reference photos of mine and gesture sketches. I added a piece of driftwood in the foreground to add interest and included the water in the background, (both of which were not in my photos). Then I went over my sketch with my stabilo. Sometimes I go straight in with the stabilo but this was a new composition and you cannot erase a stabilo. 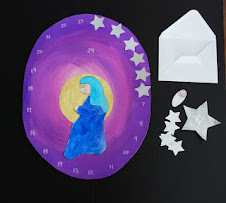 I have lots of watercolour paint in my studio but I used disk tempera to show you can easily do this project at school. Disk tempera costs a fraction of what watercolour does and I'm always impressed with how far I can push it. The secret here is to treat it like watercolour, use more water to fade out your washes. 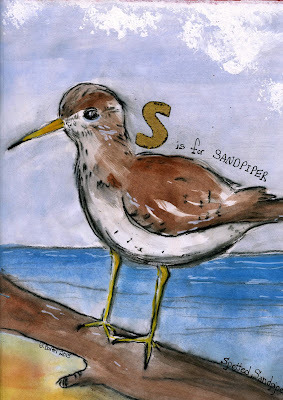 Now I paint around my sandpiper because of the stabilo, I want to control the blurriness as well as conserve my whites. I add some colour to the bird. The stabilo starts to blur forming the shadows. I use straight brown and watered down brown to get my colour variation. I also leave some areas with no paint for the white of the feathers. A nice touch is to go back and add a touch of white on top of the paint, (extra feather detail, some waves in the water). 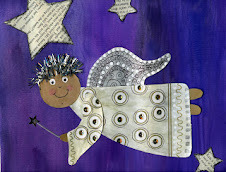 You can use white disk tempera which acts very much like gouache. I also use PITT markers which are opaque white ink, acrylic markers, at school I might use white pencil crayon, white oil pastel, or even white chalk. I add some clouds using white liquid tempera or white acrylic and a sponge. 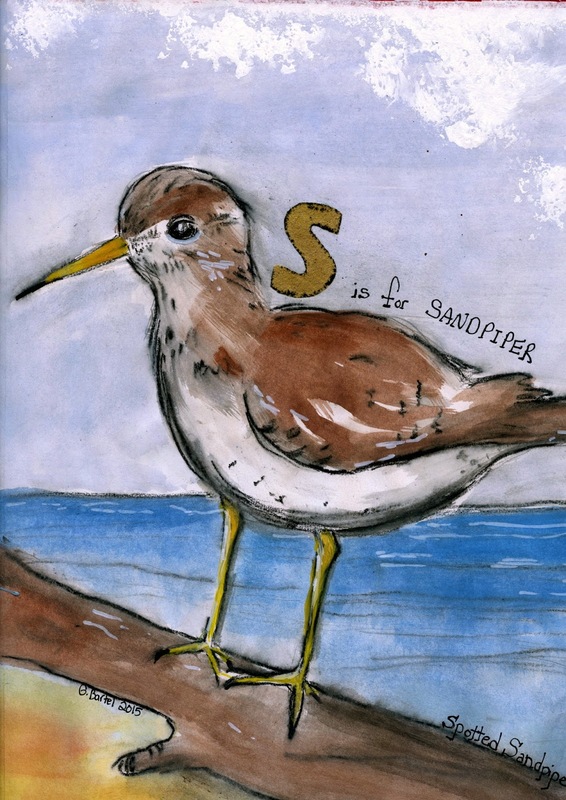 I want to add some text, because it's a sand piper I cut a letter "S" from some sandpaper. Great textural element. I made a pattern out of some scrap paper and then traced it on the back. I want it to stand out a bit so I trace around it with a black crayon. This gives the "S" a nice black outline. I glued it into place and added text with a fine sharpie pen. I take a piece of that nice paper and tape it down to my art board. 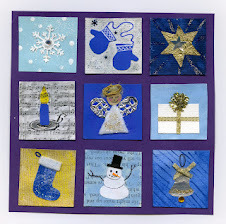 Using liquid tempera or acrylic I take a dark blue, a light blue, and a little white and paint the background. I use this cross stroke a lot for backgrounds. Start with the darkest colour and work your way down adding the lighter colours. While the background is drying I painted the paper for the posts in the pier. I use brown, black, and a little white acrylic or liquid tempera. I need a scraper so I take an old gift card and cut it to the size I want. The paper I'm using is a scrap of brown kraft paper. I dip the end of the scraper into a few colours. I then spread it down the paper getting this nice effect that looks like weathered wood. Using the same technique as for the journal page paint another bird. 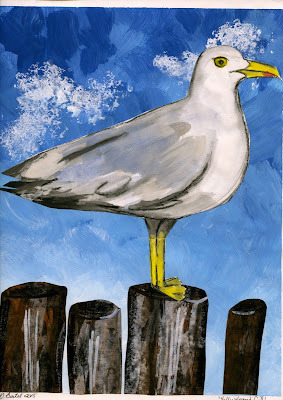 This is a seagull I photographed last year in Cape Breton and you can see I misjudged the size of paper I needed. Oh well….we'll just add some legs. Cut out the seagull and the posts. It started off as being all one piece but I couldn't get it to look right. So I cut them apart. I also added a little white for a highlight on top edge. Sponge on a few clouds and then glue the gull into place. I hope this inspires you to make a few shorebirds of your own.